I haven't written much lately about Harper's hearing loss. Things have been going well as far as school and her speech and life in general. But's she's 7.5. And suddenly this summer, she has spent a lot of mornings talking about how much she hates wearing the hearing aids. She went to gymnastics camp and a lot of kids were asking them about them. They weren't being mean or making fun of her - just being curious. But I think it just made her feel different. She likes to tell me how she is the "ONLY ONE who wears hearing aids". 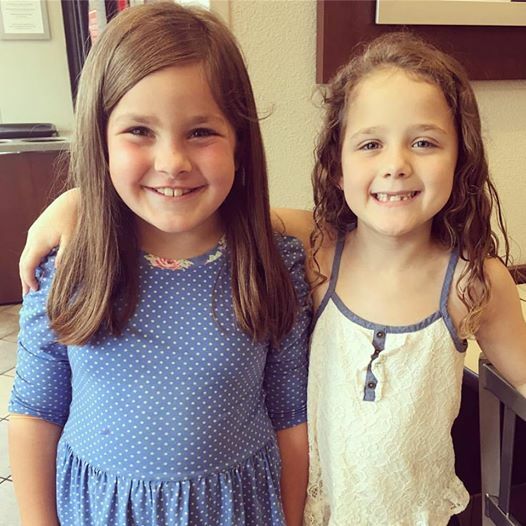 When she was first diagnosed around age 2, our audiologist tried to help us meet another family with a daughter who was the same age and had the same hearing loss. We had JUST missed them at one appointment back then. I touched base with the mom who lived near Little Rock and we even realized we had grown up in the same town but she's a lot younger than me so we had never met. Time went on and she contacted me and said they were going to be in town this weekend and wanted to know if we could meet. The timing couldn't have been better. Her daughter just got a cochlear implant a few weeks ago so it was great for me to have a chance to ask questions and to also bounce ideas off of her. And Harper was so happy just to have met another girl her age who was like her. I mean - could they be any cuter? Her mom and I hope that they will begin a friendship that will last. Hopefully as they grow, they can see each other and call each other when they need someone who understands. Isn't God good to give us just what we need in the right time? Well, Thursday Will Holden had his last day of MDO and they called me to come get him early because he was sick. When I got there there was a lady holding him who I had never seen before. She noticed Harper's hearing aids and commented that her son had them too. Then she said something about writing on a FB group about finding him some friends. And I was like "WAIT - that was you? That was ME that messaged you!" Isn't that a funny, small world? Or maybe a divine intervention.